The Nagaland Pradesh Congress Committee (NPCC) has attributed the sinking of the stretch of NH-29 near Kohima on Sunday to sheer negligence by the authorities and contractors concerned. The sinking of the road is not a new development, NPCC president K Therie said in a press release on Monday while stating that the inconvenience caused to the commuters along NH29 is deliberate and sheer negligence. Therie suggested that Governor intervene on the matter and call for a coordination meeting of all concerned. Incessant rains during the past few days caused landslide along NH-29 near Kohima town in the early hours of Sunday. It has affected a considerable stretch of the road and has completely cut off traffic on the highway. The NPCC chief pointed out that the importance of Dimapur-Kohima road (NH-29) is known to all as it is the lifeline for Nagaland as well as for Manipur. 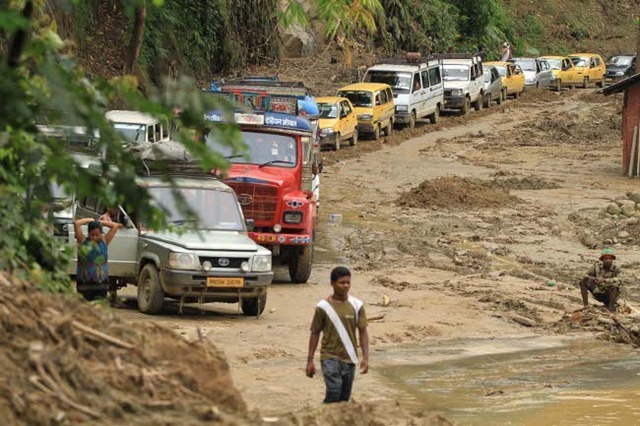 Thousands of vehicles carrying essential goods and passengers travel along the road every day, Therie said adding the condition of the road is known to every citizen, including the Nagaland Governor. He rued that the condition of the road has deteriorated beyond tolerance with dust blinding it on sunny days and slushy mud blinding it on rainy days. The road has become hazardous not only to health but also to the economy, he stated. However, there is no sign of concern for the inconvenience and sufferings caused to the public from the authorities and contractors responsible such as the state government, general manager, BRO, Jotsoma bypass to Kohima, general manager, NHIDCL, Dimapur, M/s Ramky-ECI (JV) 124-140 km, M/d Ramky-ECI (JV) 140-156 km and M/s Gayatri Project Ltd 156-172 km, he said. Stating that there is no dispute that a four-lane road is the requirement, Therie, however, said a good serviceable road cannot be deprived altogether. The NPCC chief also suggested that encroachment along the road near Kohima should be checked by the administration.